Saucon Valley junior Thomas Spirk and his Panther teammates pummeled the Palmerton Blue Bombers on Tuesday night. Saucon Valley continues to dominate Colonial League wrestling. The Panthers remain undefeated this season and have now won seventy-0ne consecutive Colonial League matches. 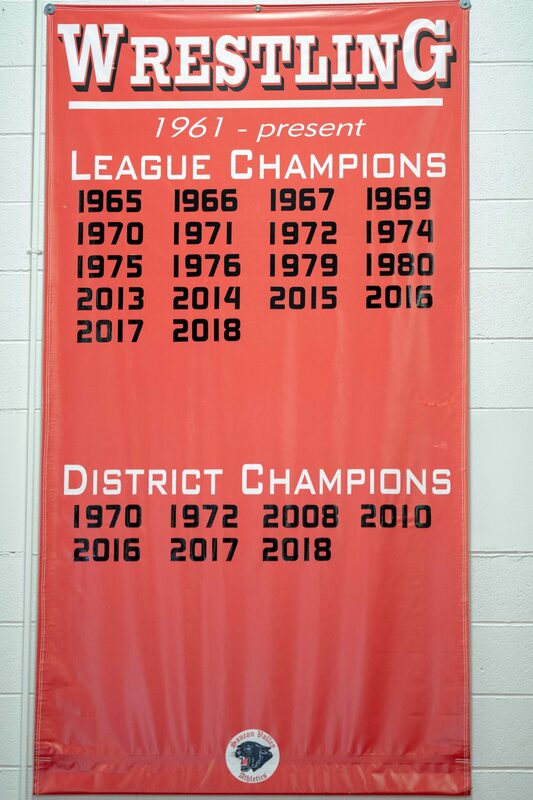 Getting ever closer to a seventh consecutive league title, Saucon took a road-trip to Palmerton on Tuesday night where they spent little time tending to their business. In only forty minutes, the Panthers finished the job with a 75-0 win over the Blue-Bombers. Sophomore Mick Sullivan stepping up for the Saucon Valley Panthers. Saucon Valley won all twelve of the contested matches. 10 of the 12 scraps were won with bonus points. There were a couple of forfeits conceded to Saucon Valley’s Kevin Dyer (120) and Ryan Gilbert (126). In addition, Dante Mahaffey (152) won by injury-default when his opponent went down awkwardly in the second period while trailing 3-1. Nonetheless, the Panthers were able to pick up seven pins courtesy of Connor Nicholas (106), Josh Jones (132), Thomas Spirk (138), Braydyn Lugardo (182), Dane Csencsits (195), Mick Sullivan (220) and Nick Warnke (285). All falls came in the first period. Junior Dane Csencsits (20-5) claimed the quickest victory of the night with a cement job that flattened his opponent in only :06 seconds. 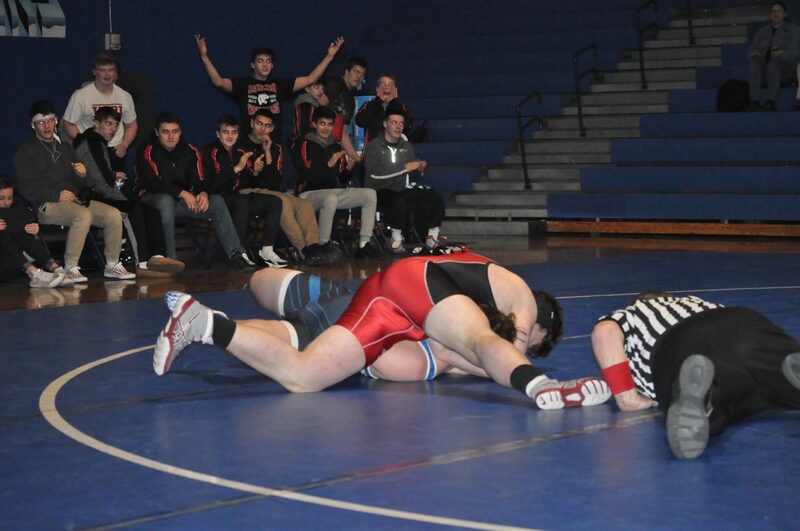 It was Csencsits’ thirteenth pin of the season. The trip to Palmerton proved to be a Panther pinning parade. Nick Rosengrant wrestled a great match against the Blue Bombers. 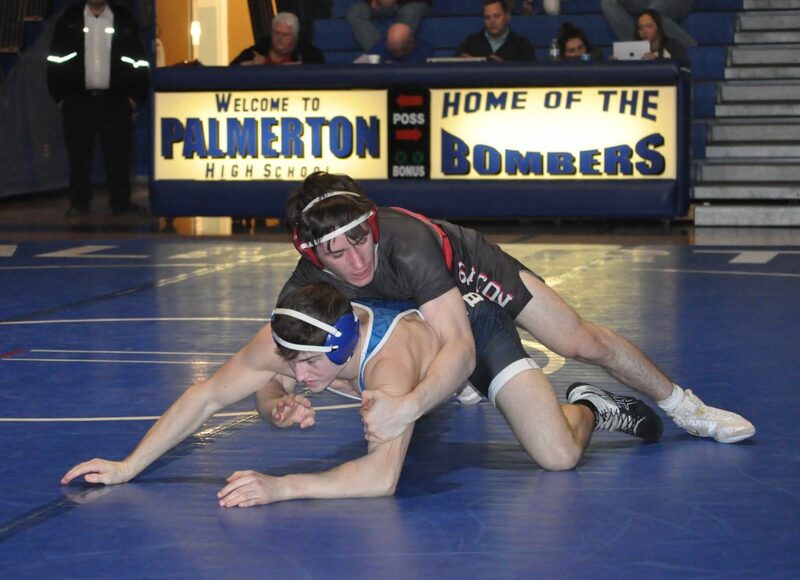 Saucon Valley also earned bonus points from senior Nick Rosengrant (145) and junior Matt Arciuolo (160). 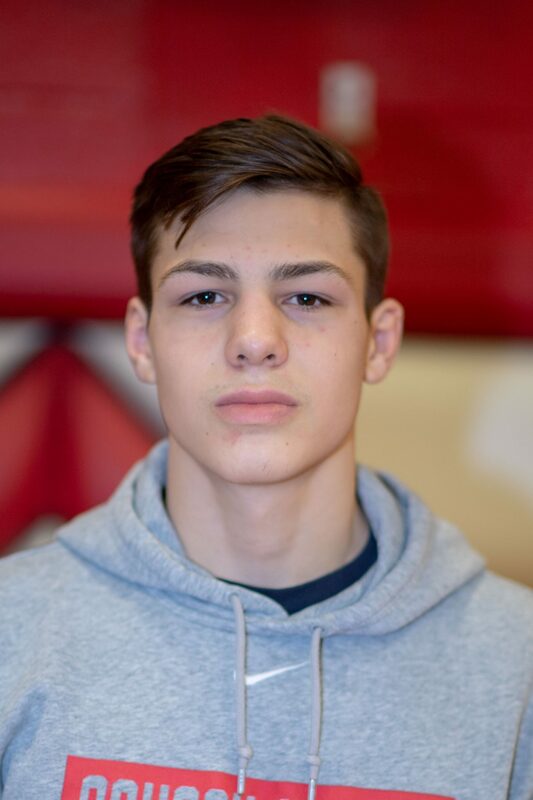 Rosengrant, who was named by Coach Shirk as wrestler of the match, used a couple takedowns, three near-fall points and a reversal to seal his 9-1 major-decision against Palmerton senior Lucas Christman. Arciuolo (23-4) manufactured four, first-period takedowns and a couple of near-fall turns into a 14-2 lead at the end of the first period. The Panther then wrapped a couple more takedowns around a gifted escape to build an 18-3 lead and secure the technical-fall about half way through the second period. Of his twenty-three wins so far this season, Arciuolo shows that he scores big with eight technical-falls. Saucon junior Matt Arciuolo is in control and scoring a lot of Panther points. Freshmen Cael Markle (113) and Ty Csencsits (170) each added decisions for the Panthers. After a scoreless first period, Markle finished with an escape and two takedowns to defeat junior, Gabriel Ramos 5-0. Csencsits (12-6), who has wrestled half of his matches at the 152 lb. weight class, bumped up and jumped out to an 8-0 advantage. Ty was able to hold on for an 11-4 victory against junior, Dylan Gonyo. 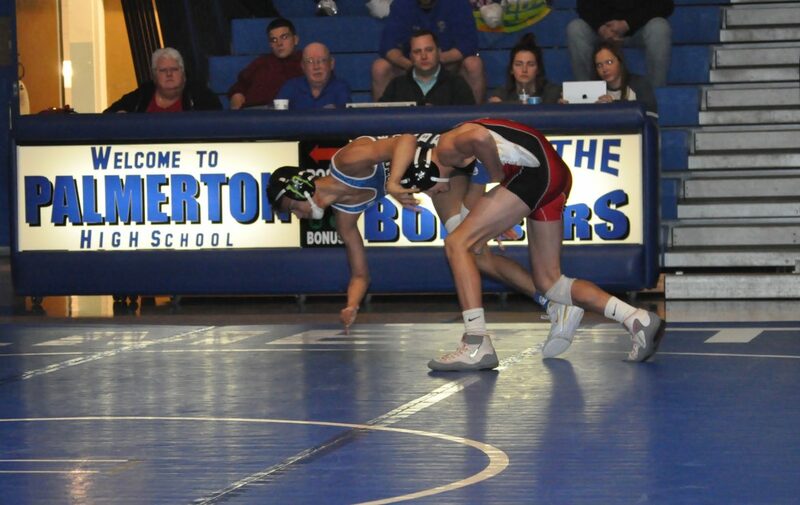 With his win against Palmerton, Panther freshman Cael Markle improved to a 16-9 record. 106- Connor Nicholas Fr., Saucon Valley, pinned Aaron Gardner Fr., :15. 113- Cael Markle Fr., Saucon Valley, dec. Gabriel Ramos Jr., 3-0. 120- Kevin Dyer Jr., Saucon Valley, winner by forfeit. 126- Ryan Gilbert Fr., Saucon Valley, winner by forfeit. 132- Josh Jones Sr., Saucon Valley, pinned Dennis Lombardi Fr., :15. 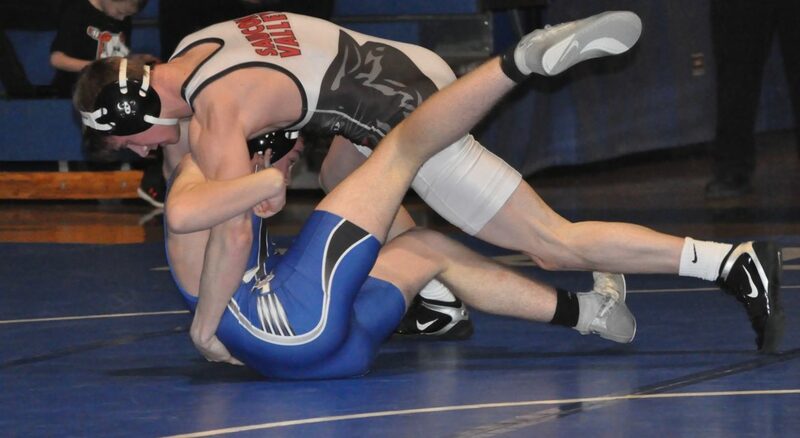 138- Thomas Spirk Jr., Saucon Valley, pinned Colton Stroup So., :38. 145- Nick Rosengrant Sr., Saucon Valley, maj-dec., Lucas Christman Sr., 9-1. 152- Dante Mahaffey Fr., Saucon Valley, inj-def., Matt Lalik Jr.
160- Matt Arciuolo Jr., Saucon Valley, tech-fall., Hunter Fierro Sr., 18-3, 3:11. 170- Ty Csencsits Fr., Saucon Valley, dec. Dylan Gonvo Jr. 11-4. 182- Braydun Lugardo Jr., Saucon Valley, pinned Aiden Melber Jr., :20. 195- Dane Csencsits Jr., Saucon Valley, pinned Chris Lucykanish Jr., :06. 220- Mick Sullivan Fr., Saucon Valley, pinned Jermey Mooney Fr., 1:39. 285- Nick Warnke Jr., Saucon Valley, pinned Michael Stepp Sr., :47. Up Next: On Thursday, Saucon Valley will host the undefeated Wilson Warriors in a Colonial League showdown. The Warriors are for real and claim dominant wins over Pen Argyl (60-17), Salisbury (78-3), Northern Lehigh (57-21) and Northwestern Lehigh (58-8). This is going to be nasty!